Posted on November 12th, 2015 . Locate the main electric fuse box, water service main, and natural gas main. Learn how and when to turn these utilities off. Teach all responsible family members. Keep necessary tools near gas and water shut-off valves. Remember, turn off the utilities only if you suspect the lines are damaged or if you are instructed to do so. If you turn the gas off, you will need a professional to turn it back on. Pick one out-of-state and one local friend or relative for family members to call if separated by disaster (it is often easier to call out-of-state than within the affected area). Post emergency telephone numbers near telephones. Teach children how and when to call 911, police and fire. Teach children how to make long distance telephone calls. Instruct household members to turn on the radio for emergency information. Learn the safest route from your home or job to high, safe ground in case you have to evacuate in a hurry, and be sure to keep your gas tank full!! Take a basic first aid and CPR class. Make at itemize list of personal property, including furnishings, clothing and valuables; photograph your home inside and out, which will help settle insurance claims. Keep photos in a safe deposit box. So, that takes care of the family, now what else could we do to avoid damage to our property. Let’s think about the following actions that we could take in the event of flooding. Moving items to be left in the structure to an upper floor or stacked on top of each other to put at least some furniture above flood level. Throwing curtains and drapes up over rods. Pulling up and removing carpets and rugs. Motors to be removed from furnace and other equipment located in the low levels of the house. Unplug equipment that can’t be moved. Assemble medicine, heirlooms, valuables and other items to be for taking during evacuation. Now, let’s get real. With water falling from the sky everywhere, you might think that enough is enough (water, we mean)! The fact is, you are going to need a supply of clean fresh water for drinking, food preparation and bathing. You should try to store enough water for everyone in your household. You should have on hand at least one gallon of water per day for each individual. Store water in sealed, unbreakable containers. Identify the storage date and replace every six months.  A supply of non-perishable packaged or canned food and a non-electric can opener.  Blankets or sleeping bags.  An extra set of car keys.  Inexpensive rabbit-ears television antennas to use when cable goes out.  Special items for infants, elderly or disabled family members. Do so immediately. Use travel routes recommended by local authorities. Don’t try to cross water flowing above your knees. Listen to a battery-operated radio for news, updates and evacuation instructions. Do not drive where water is covering the road. You can be stranded or trapped. Also, parts of the road may be washed out. Do not try to cross waters of unknown depth. The water may be much deeper than it looks. Avoid dips and low spots. If your car stalls in a flooded area, abandon it as soon as possible. Floodwater can rise rapidly and sweep a car and its occupants away. 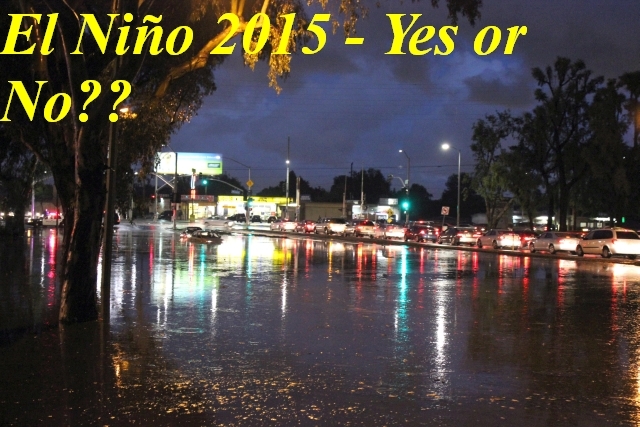 So, if you believe what the experts are telling us about this year’s El Niño, it is better to do a bit of preparation now and avoid the last minute rush. Supplies for much needed emergency items will diminish fast once the storm is upon us. If you do not believe the so-called experts, then maybe you should consider doing these things anyway for any upcoming disaster. Please stay dry and be safe!